Rusting barbed wire and a blue blue sky. It's one of those dream combinations that you just have to photograph, especially when the wires divide up that blue nothingness. Just tweak the focus ring just right and click. You know it's going to come out just right. That's an excellent picture; reminds me of this icon pic somewhat. 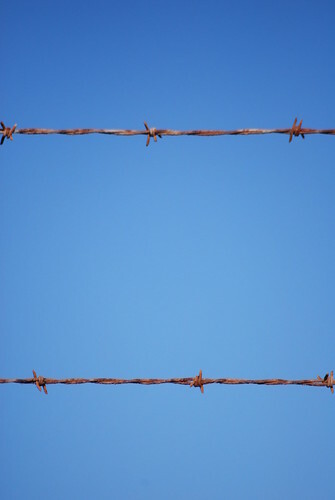 On the subject of barbed wire, I am very irritated at myself for screwing up the sky in this image. Must remember that the camera only goes down to 1/250 of a second, and that anything quicker uses the electronic "shutter".